The reputations of Reagan-era officials who enabled the Guatemalan genocide have not been tarnished. 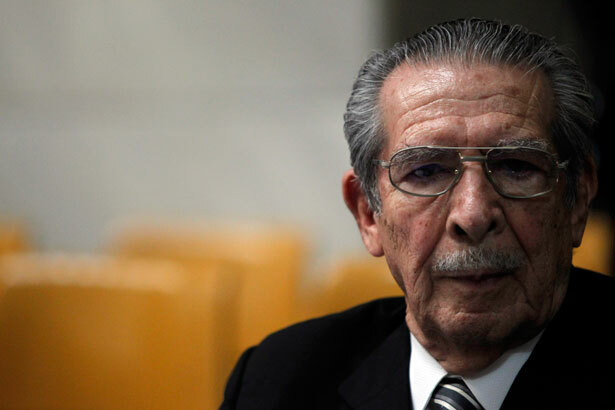 Under the direction of Gen. Efraín Ríos Montt, Guatemala’s then-dictator, the country’s military forces engaged in crimes against humanity—including genocide—against the indigenous people in the Ixil region of the department of Quiché, according to the findings of a three-judge panel. (A constitutional court later vacated the sentence on technical grounds but did not challenge the findings [see Kate Doyle, “Guatemala’s Genocide on Trial,” June 10/17].) Largely ignored during the trial, as a thoughtful piece by The New York Times’s Elisabeth Malkin observed, was the role of top Reagan administration officials—including Ronald Reagan himself—in helping to empower and then cover up the Guatemalan military’s crimes. In 1999, a UN investigative body known as the Historical Clarification Commission reported that Guatemala’s military and paramilitary forces were responsible for 93 percent of the 42,275 cases of people who, in the words of human rights activist Aryeh Neier, were “murdered, disappeared, raped, or tortured”—and that number covered little more than 20 percent of the estimated victims. President Clinton traveled there and apologized for the US role in these crimes. But what I find interesting is how little the act of helping to engender—and then justify—the genocide has mattered to the reputations of the former US officials who helped it along. Thomas Enders was rewarded with an ambassadorship to Spain. Elliott Abrams was raked over the coals a bit during Iran-Contra for lying to Congress, but not for his role in helping to ensure that the Guatemalan military’s mass murder continued unimpeded. Following a high-level Middle East policy job in the second Bush administration, Abrams was welcomed by the Council on Foreign Relations and frequently gives paid speeches to synagogues and Jewish groups. George Shultz, meanwhile, is as respected a former statesman as anyone alive, and Ronald Reagan, of course, has been turned into an American icon. Franklin Roosevelt’s reputation has suffered grievously for his relative inaction during the Nazi Holocaust. Henry Kissinger is considered a “war criminal” even in some polite company for his tangential role in the Cambodian genocide of the 1970s (as well as his role in the 1973 Chilean coup). And yet, for some reason, those who encouraged and apologized for the genocidal rampages of the Guatemalan regime have gotten off scot-free. This is itself a kind of crime. How about the next time that, say, Elliott Abrams speaks at a local synagogue, worshipers inquire as to which genocidal murders he condemns and which he not only supports, but actually helps to make possible? Frank Smyth wrote about the Ríos Montt trial earlier this year, and asked if other Guatemalan military officers would ever face justice for their role in that country's genocide.